Just as Google Nexus 7 tablets are starting to make their way out to consumers, the tablet has received a minor over-the-air update, the second OTA for those who got the Google I/O edition. 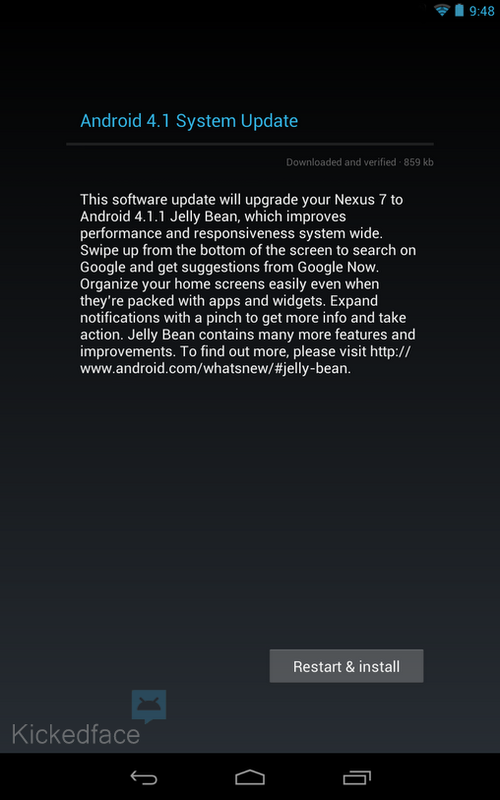 As far as we can tell, this is a minor update for the Jelly Bean tablet, weighing just 859KB and updating as quickly as you'd expect for a file of that size. The only change we've noticed so far is the addition of a little more technical info in the "About Tablet" screen. FCC ID, IC and model number have been added, presumably to give folks an easy way of finding that stuff if they don't hold onto the sticker that's fixed to the back of the tablet. If you've noticed anything new on your own device, be sure to shout out in the comments.